The Catman 1978: Rock and Roll for elevators. o fully appreciate the Peter Criss Solo album, one must either beat oneself about the head with a golf club, or decouple oneself from the KISS caravan. Lose the frame of mind that the drummer from KISS owes you more heavy music in the form of his solo album – because he doesn’t. These Solo albums – intentionally or not – delve deeper than the hard rock hive mind of the four superheroes that graced the cover of Love Gun. 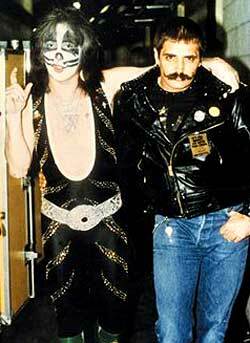 This is solely about Peter Criss, and HIS barbaric yawp to the universe. 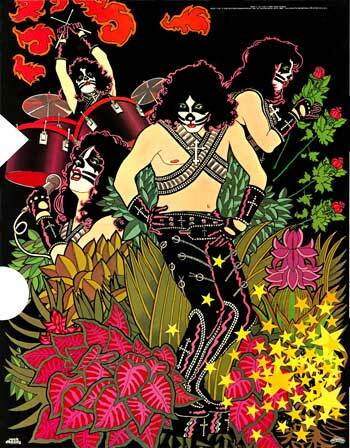 So slide into a bluesy, froozy, Adult Oriented Rock frame of mind and you might actually enjoy The Catman’s offering to the KISS canon – unlike most KISS fans. 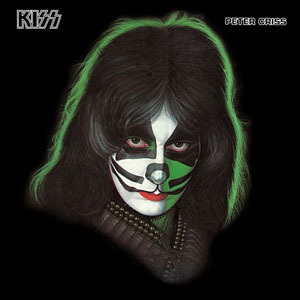 After two very weak opening numbers, Peter Criss settles into a listenable soft rock/MOR album, filled with experiments in lighter fare, like samba, gospel and rock ballads, with its high points decidedly not in the KISS vein. Criss is renowned for his gritty street rock and roll voice, however, on most of this album, he keeps it in a calmer, cleaner, lower register, rarely pushing to that raw edge (as he did in Black Diamond 1974, or Hooligan 1977). 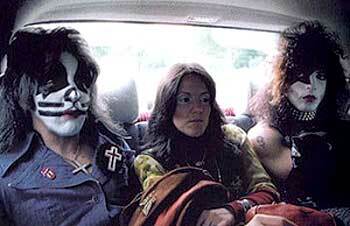 Peter Criss, wife Lydia Criss, and a mime. Stan Penridge (1961-2001, who co-penned Beth), a bandmate from Criss’s previous bands Chelsea and Lips, features heavily on the album, as co-songwriter and guitarist. Criss would rely greatly on Penridge as he did not play an instrument; we presume the musicality of the compositions came from Penridge or others, while Criss supplied lyrics and melody lines, if anything. 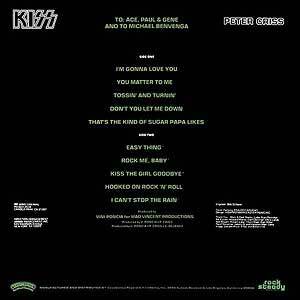 Each KISS Solo album, to retain its cohesion under the KISS aegis, was dedicated to the other three band members. Hence, Peter’s was “To: Ace, Paul & Gene” with an added dedication “And to Michael Benvenga” – a band member/friend from Lips who died before Peter could fulfill his promise to have him perform on his album. I’m Gonna Love You. The writing team that brought us Beth (Criss and Penridge) open the album, but to quote a Paul song, something “Ain’t Quite Right.” What is this AOR tunelessness? A medium-paced rocker with shades of Todd Rundgren and Billy Joel – with one hand tied behind their backs. You Matter to Me. Producer Vini Poncia co-writes this simply rancid TV sitcom theme. With its tiny synth melody hook, thin guitars and tuneless verses, it’s like we’re watching BOSOM BUDDDIES or WHO’S THE BOSS. Tossin’ and Turnin’. A #1 hit for Bobby Lewis in 1961, Criss covers this old time rock and roll with big choruses, female backing vocal and – cowbell. The first catchy song on the album. Whoever put this collection together actually did a good job of building from nothing to an intense closer (I Can’t Stop The Rain), with healthy sidesteps into other genres in between. Don’t You Let Me Down. This cool, slow samba groove is one of the best songs on the album, well constructed by Penridge and smoothly performed by Criss, who excels at this breezy, jazzy style. That’s the Kind of Sugar Papa Likes. An enjoyable easy listening rock song from Criss and Penridge, trying in vain to be hard rock; the kind of “rock” that would sound “sooo heavy” if Barry Manilow was piling into it. Easy Thing. Penridge strums, Criss croons; subtle delivery, with orchestration and gospel female backing vocals. the backbeat and the right hand. Rock Me, Baby. Honky-tonk piano, horn section, big female backing vocals; written by Sean Delaney (friend of Criss and KISS fixture as co-songwriter and road manager). Kiss the Girl Goodbye. Plucked 12-string by Penridge, falsetto by Criss. Not a bad experiment. No drums. Hooked on Rock ‘n’ Roll. A matured version of Rock Me Baby, like a fine cheese. Criss drives straight ahead with a rock and roll thumper, pulling that raspy voice we know so well. I Can’t Stop the Rain. 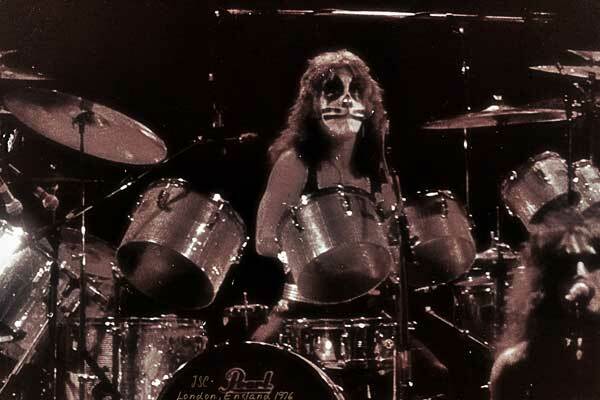 Sean Delaney pens by far the best song on Peter Criss. A 10-star ballad, classic construction, piano underscoring a lament of heart-wrenching proportions, building to poignant orchestration and an epic fadeout; a coldness that can never recapture warmth: “The night’s gonna fade / But the pain’s gonna stay / Makes me wonder / Have you ever made love to me?” A fitting closer that leaves the album on a high note. The kid from Brooklyn New York who felt he had nine lives might not have delivered what the world expected, but it was a day of celebration for elevator muzak. Peter Criss, though good for its r&b/ soul/ Middle Of the Road niche, was the least appreciated of the four Solo albums, and did not sell as well as the other Solos. Stan Penridge, Vini Poncia, Michael Morgan, John Vastano, Ritche Adams, Malou Rene, Sean Delaney. by Jon Dunmore © 6 Dec 2015.